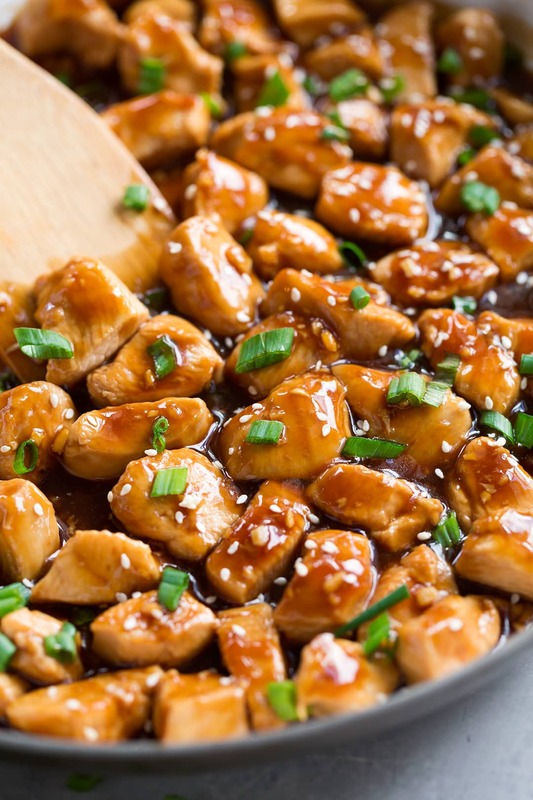 This Teriyaki Chicken recipe will quickly become a new favorite! 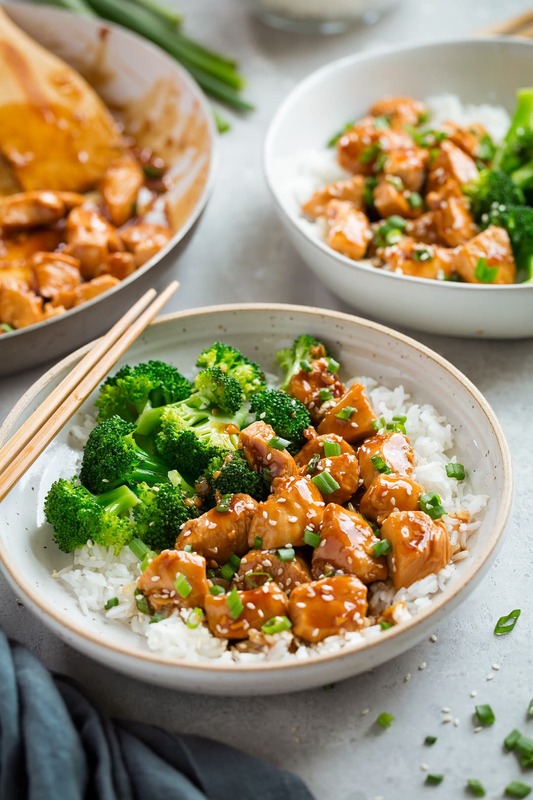 In this one pan recipe, bite size chicken breasts pieces are sautéed in a skillet then coated with an easy and delicious teriyaki sauce. This tastes just like your favorite Chinese take-out but you can have this ready faster than the time it would take to go pick up take-out! 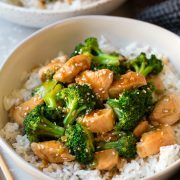 I’ve shared other teriyaki chicken recipes like my Grilled Teriyaki Chicken Bowl but this hands down beats the prep and cook time on any other teriyaki chicken I’ve tried. And yet it tastes just as good! Plus it’s such a flavorful sauce so it doesn’t even require marinating. Want to see how easy this recipe is? Watch the video! 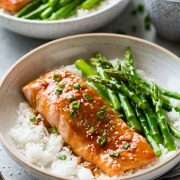 It’s a (mostly) healthy recipe that comes in at 258 calories per serving so it a smarter choice than the deep fried food you usually get from your favorite Chinese take-out. Add chicken and let cook (giving space between pieces) until slightly browned on bottom then flip chicken pieces over and cook through. While the chicken is cooking whisk together the teriyaki sauce mixture. Pour sauce into the skillet once the chicken is just nearly finished cooking through and let the sauce cook and simmer until thickened. Easy as that! Serve it warm over brown or white rice with steamed veggies. If desired use all honey in place of the brown sugar. Substitute rice vinegar with apple cider vinegar or lemon juice if that’s what you have on hand. Use well trimmed chicken thighs in place of chicken breasts. Adjust the saltiness to suite your personal preference, reduce the soy sauce as desired then add more water in it’s place. The ratio here is the balance I like. The sesame oil can be omitted, I’ve also made this without and it’s still delicious. Or add more if you love that flavor. In a pinch you can use dried ground ginger in place of fresh, I’d go with 1/2 tsp. I’m telling you this is a must-try recipe! It’s one of my favorites for busy weeknights. 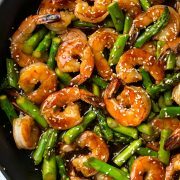 It’s something everyone in my family loves and when I serve it with brown rice and steamed broccoli or asparagus it’s something I feel great about feeding them. This Teriyaki Chicken recipe will quickly become a new favorite! 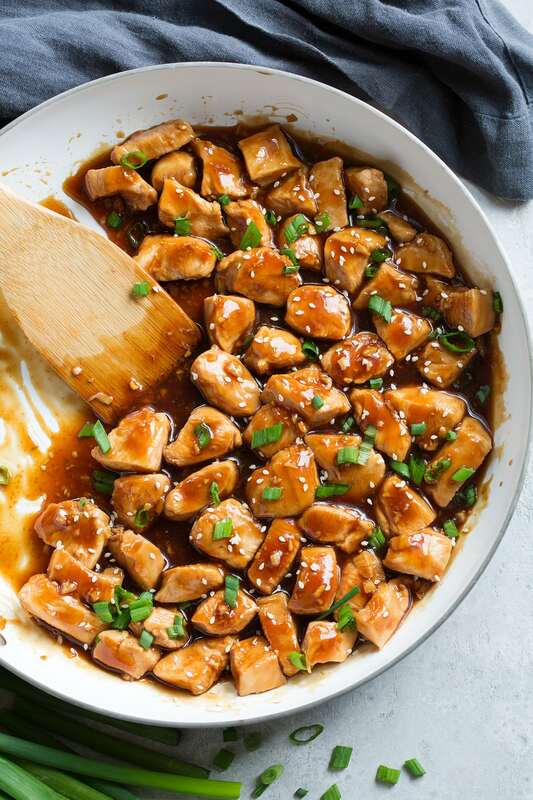 In this one pan recipe, bite size chicken breasts pieces are sautéed in a skillet then coated with an easy and delicious teriyaki sauce. To make this a 15 minute recipe prep the sauce mixture while the chicken is cooking. Add in chicken and let brown on bottom about 3 - 4 minutes then flip and continue to cook until center registers about 160 degrees, about 3 minutes longer. 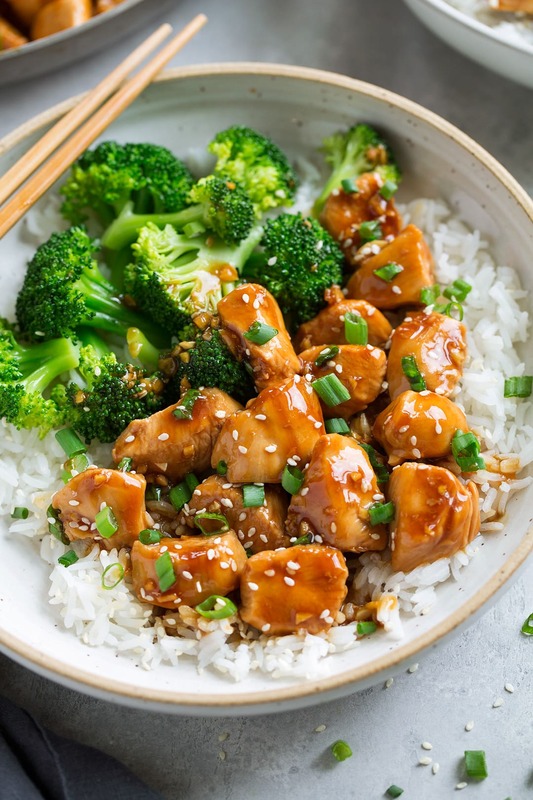 While chicken is cooking, in a small mixing bowl (or liquid measuring cup) whisk together soy sauce, water, honey, brown sugar, rice vinegar, sesame oil, ginger, garlic and cornstarch. Stir the sauce in with the cooked chicken and continue to cook and toss until sauce has thickened, about 30 - 60 seconds longer. Serve warm garnished with green onions and sesame seeds if desired.